One of the best known functions of wetlands is to provide a habitat for birds. Birds use wetlands for breeding and rearing young. Birds also use wetlands for feeding, resting, shelter, and social interactions. Some waterfowl, such as grebes, have adapted to wetlands to such an extent that their survival depends on the availability of certain types of wetlands within their geographic range. About one-half of the 188 animals that are federally designated as endangered or threatened in the U.S. are wetland-dependent (Niering, 1988). 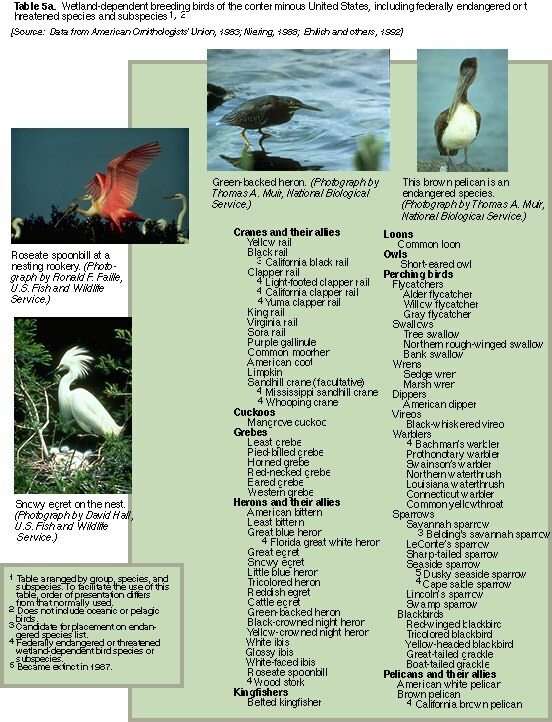 Of these federally listed animals, 17 are bird species or subspecies. http://water.usgs.gov/nwsum/WSP2425/images/table5a.jpeg. There are both migratory and resident species inhabiting the San Francisco Bay wetlands. Some species like the American avocet and black necked stilt use the tidal marsh for nesting and breeding. Western sandpipers, marbled godwits, and long-billed dowitcher are migratory shorebirds that use the Bay wetlands for resting and feeding. The largest number of individuals of these species have been found in the far North Bay and far South Bay and along the east side of the South Bay. The California clapper rail is resident specie that inhabits tidal marsh specifically where cordgrass and pickleweed occur. It nests along channels and feeds throughout the intertidal zone of San Francisco Bay. Other resident species that rely on the tidal marsh include salt marsh yellowthroat, salt marsh song sparrow, and the California black rail. Herons and egrets are along tidal sloughs and shallow ponds although they prefer to nest in tall trees. For most wetland-dependent birds, the loss of breeding habitat translates directly into smaller populations. As wetlands are destroyed, some birds may move to other less suitable habitats, but reproduction tends to be lower and mortality tends to be higher. The birds that breed in these poorer quality habitats may not contribute to a sustainable population through the years (Pulliam and Danielson, 1991). Wetlands provide food for birds in the form of plants and invertebrates such as shellfish. Birds also feed on small mammals and other birds. Some birds forage for food in the wetland soils and tidal mudflats, some find food in the water column, and others feed on the vertebrates and invertebrates that live on submersed and emergent plants. Birds find shelter in wetland vegetation from predators and the weather. The presence or absence of shelter may influence whether birds will inhabit a wetland or a nearby upland area. Predators are likely to abound where birds concentrate, breed, or raise their young. Tidal channels and islands in wetlands are a barrier to land-based predators and reduce the risk of predation to nesting or young birds. However, some predators, such as the raccoon, are well adapted to both wetland and upland environments, and take large numbers of both young and nesting birds. Snakes, fox, feral cats, rats, predatory birds, and other animals take their toll as well. The same vegetation that hides birds from predators also provides some shelter from severe weather. During cold and stormy weather, waterfowl such as canvasback ducks protect their young from windchill in the shelter of a marsh. Shorebirds are among the most conspicuous wildlife of the North and South bays. Thirty-eight species of wintering and migratory shorebirds were found in the Bay between 1988 and 1995 on surveys performed by the Point Reyes Bird Observatory (PRBO). Total numbers of shorebirds on these surveys ranged from 340,000ñ396,000 in the fall, 281,000ñ343,000 in the winter, to 589,000ñ838,000 in the spring. Approximately two-thirds of the migrating and wintering shorebirds occurred in the South Bay. These birds prefer to feed in the mudflats but will use open marsh areas, levees and islands during high tide when the mudflats are covered. The San Francisco Bay area is one of the most important coastal wintering and migratory habitats for Pacific Flyway waterfowl populations. They do not breed in the Bay but use it during migration for feeding and resting. The San Francisco Bay is particularly important to the future of canvasback and other diving duck populations of the Pacific Flyway. Significant numbers of the Pacific Flyway scaup (70%), scoter (60%), canvasback (42%), and bufflehead (38%) were located in the San Francisco Bay/Delta. According to the 1998 California Fish and Wildlife surveys, San Francisco Bay held the majority of Californiaís 1999 wintering scaup (85%), scoter (89%), and canvasback (70%) populations. More than 56 percent of the Stateís 1999 wintering diving ducks were located in the San Francisco Bay proper, which includes the salt ponds and wetlands adjacent to the North and South Bays. Although the San Francisco Bay is most recognized for its importance to diving ducks, large numbers of dabbling ducks like pintail (23,500 birds) and widgeon (14,000 birds) were observed during the 1999 midwinter waterfowl survey. Wetlands and deep waters of the San Francisco Bay provide important habitat for a wide variety of fish and shellfish. Subtidal eelgrass beds shelter larval and juvenile fish, as well as many species of invertebrates. Salt marshes and shallow water areas provide habitat for larval, juvenile, and adult fishes and shellfish including shiner perch, topsmelt, staghorn sculpin, striped bass, and bay shrimp. Common fishes of the Central and South Bay tidal marshes include arrow goby, yellowfin goby, and staghorn sculpin. Important commercial and sport fishes that utilize deepwater habitats include northern anchovy, starry flounder, striped bass, king salmon, sturgeon, steelhead, and American shad. The Coho salmon and the steelhead, two federally threatened fish, species occur in the vicinity of the South Bay. Few mammals are as closely tied to wetlands as are many birds, but many mammals exploit abundant food supplies or shelter during certain periods of the year. The most abundant marine mammal associated with wetlands and deepwater habitats of the Bay is the harbor seal. This species uses tidal salt marshes and mudflats for breeding, hauling out (resting out of the water), and raising their young and deepwater habitats for foraging. The sea lion is another important marine mammal of the San Francisco Bay. Tidal marshes also provide habitat for small mammals including the Suisun shrew, salt marsh wandering shrew, and salt marsh harvest mouse. The endangered salt marsh harvest mouse and the Suisun shrew are totally dependent on wetlands. The salt marsh harvest mouse can be found in salt and brackish habitat and in diked and tidal areas. They hide in dense pickleweed, which they use for food and shelter. Wetlands are home to a community of plants including green algae, red algae, sea lettuce, eelgrass, pickleweed, and cordgrass. Wetland plants are specialized in that they have adapted to the variations in salinity and soil saturation or partial submergence. However, more than 50 plant species found in the Bay marshes at the turn of this century are now extinct or exist in isolated populations. Locally extinct species include sea-pink, salt marsh owl's clover, and smooth goldfield (all eradicated throughout the South Bay); and California sea-blite and California saltbush (eradicated throughout the Estuary). Today, tidal marshes are home to rare plant species such as the Point Reyes birdís-beak, soft birdís beak, Suisun thistle, Masonís lilaeopsis, and Delta tule pea. Wetland plant communities vary markedly from one part of the San Francisco Estuary to another. The variation correlates strongly to salinity patterns and to other factors such as substrate, wave energy, marsh age, sedimentation, and erosion. For example, a tidal marsh on Montezuma Slough in Suisun, which has tall tules and cattails along the channels, looks very different compared to a tidal marsh on the Palo Alto bay front which has low-growing pickleweed and Pacific cordgrass along the channels. Additional plant species on tidal marsh include fat hen, marsh rosemary, alkali heath, and jaumea. Levees within tidal marshes support coyote brush and gum plants. Shaw, Samuel P. and C. Gordon Fredine. 1956. Wetlands of the United States - their extent and their value to waterfowl and other wildlife. U.S. Department of the Interior, Washington, D.C. Circular 39. Northern Prairie Wildlife Research Center Home Page.